I am part of the Board Game Blogger Club and am sent board games occasionally to test out. 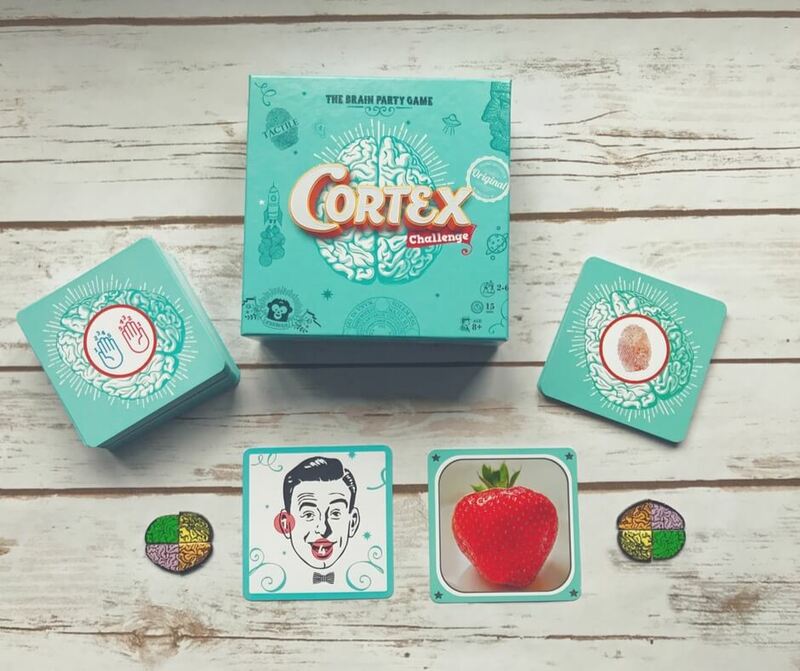 We were recently sent Cortex Challenge, a brain training game. The box is small and on opening it took a little time to figure out what we were meant to do. After reading the rules and working out what to do we started playing the game. Challenge yourself in a fun, quick-thinking game that will test your brain power to the max! Race other players to be the first to match symbols, correctly remember all objects on a card or find the route out of mazes, amongst many other tests. Winning challenges allows you to add pieces to your all-important brain puzzle, which must be completed before your opponents in order to win the game! The idea of the game is to look at the card and do what the instructions say, when you’ve figured out the answer you cover the card - hopefully before anyone else does. There’s an interesting “touch” element to the game too with touch cards. If you have the right answer you keep the card. You collect the cards and when you have two of a particular type you can trade them in for a brain piece. When you have completed your brain (have 4 brain pieces) you win. The game takes about 15 - 20 minutes to play and even in one game we learnt a lot. To start with we all did the tests at the same time but soon figured out that LP, our 8 year old, needed a head start. Within 10 minutes the Hubby and I were way ahead and LP was sulking. He couldn’t work out why he couldn’t do it, he decided he was “just rubbish”. With each card we gave LP either a 2 or a 3 second lead in which he could look at the card and no one else could. To be honest it didn’t help him much because he tried to work out the answer and cover the card in those 2-3 seconds. Inevitably the Hubby and I were way ahead and by the end of the game one card decided who won - and it was me! Obviously I was really pleased with winning (I don’t win games often) but after playing just one game we realised that Cortex Challenge is not a “family” game. You can’t have adults against children because it’s just not fair. Adults can work out answers far more quickly than children (at least in this game) and that makes the children feel like the game is unfair. We told LP that next time he wants to play the game he should just play with BP, that way he might have a chance at winning. On the box it says that this is for ages 8+ and while I think that’s right you need to have people with similar abilities against one another. All 8 year olds would be fine, all children probably fine, but a family with two adults and two children - not great. I felt bad for LP. Cortex Challenge was a fun and quick game which can be slotted in to fit around other things and I’d be inclined to play again. Cortex Challenge is available to buy for £12.99 and is suitable for 2-6 players aged 8+. Have you ever tried a brain training game?